My Memory and Ancestor altar has been something I've been diligently working on for a few months now. In fact, questioning my mom for pictures of my family is one of the reasons my mother asked if I was pagan. At least she kind of gets it! Paganism is all about roots, both the flora and family kind. Building this altar as part of my spiritual room was essential to keeping me rooted. 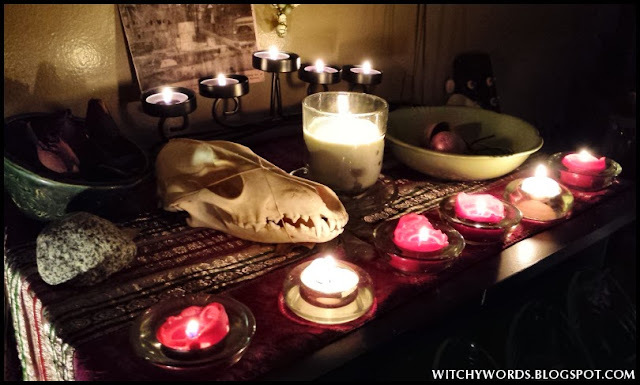 When I found out that I might be facing a life-changing illness, it was this altar I turned to. "Ancestors, hear my plea - the blood of you flows through the blood of me," I chanted as I lit the altar. I then simply stood in front of my family and friends who have passed before me and talked. I talked of my fears, hopes and dreams. I told them how grateful I was for the life they have given me and how deeply I wanted to either (a) continue living long into my older years or (b) be accepting of whatever comes my way. Because my eyes are the root cause of concern, I left my glasses on the altar overnight. Today was the day I was going to get some answers to what's been going on with my eyes. Turns out, it's good - no, fantastic news. My MRI and blood work came back clean! After visiting an ophthalmologist at a local hospital, I found out that it's my immune system overreacting to a corneal ulcer I developed while moving in August. Aleve twice a day for a month and I'm clear! And I can even begin wearing my contacts again as of next week! Can't deny the amazing ways of those passed through the veil. Tonight, I returned my altar and lit it to show gratitude for the gift of health that was handed to me. I gently asked if I could take pictures while it was lit and was overcome with the warmest, sweetest goosebumps. 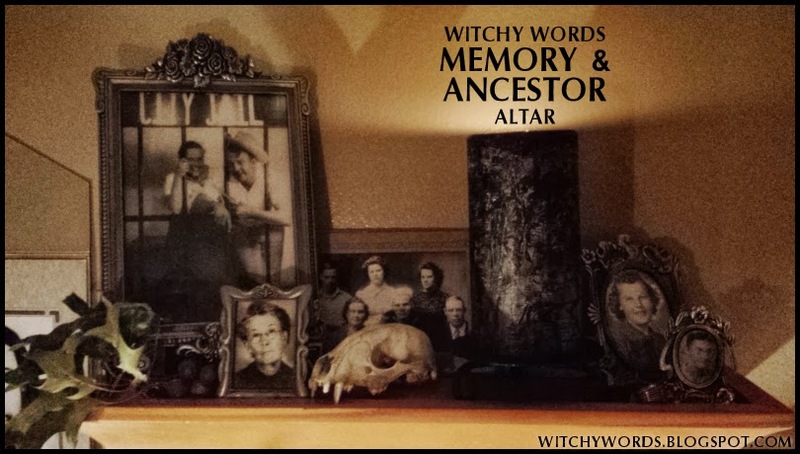 So I officially present to you my Memory and Ancestor Altar! This is the fruit of my spiritual labor. 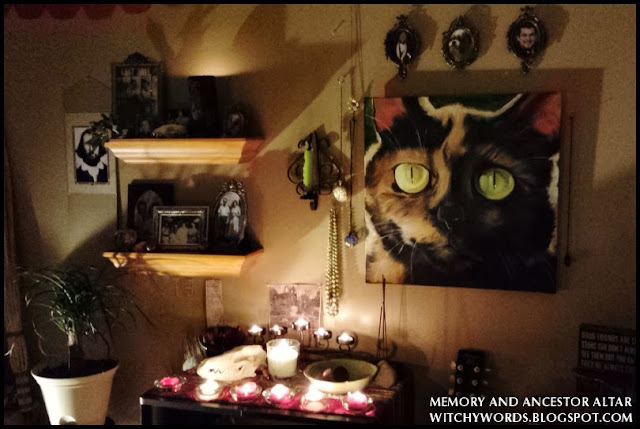 Trinkets, newspaper clippings, pictures and even a painting of the deceased adorn my Memory and Ancestor Altar. The main altar is primarily candles. A skull sits atop it to remind me of mortality. In a dark green bowl closest to the viewer is a variety of dried roses I've collected over the years. I actually made that bowl myself in ceramics class. It's not nearly as delicate and well-done as the green bowl to the right - a bowl my maternal great grandmother made. She was spectacular with ceramic work. 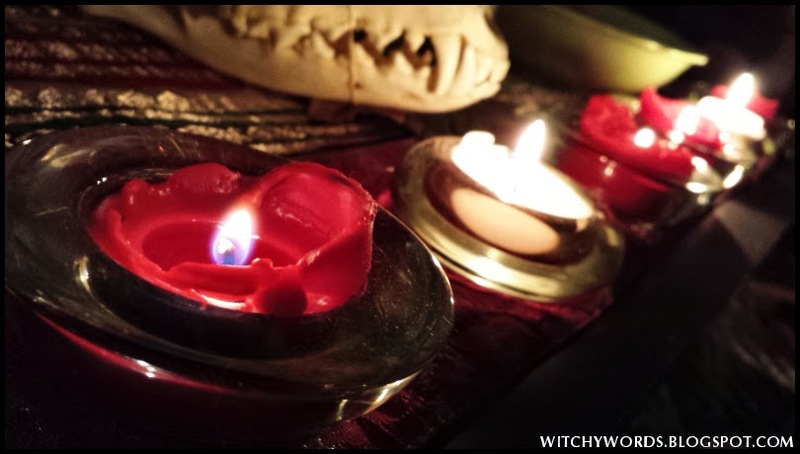 Inside the bowl are a variety of trinkets that I couldn't hang, including keys, rings, the memory ribbon from last Samhain and the egg I opened for Ostara containing petrified wood - a stone that often connects you with your ancestors and those passed. On the far right is a large stone, not visible in this picture, that comes from the backyard of the home I grew up in. Finally, a place for incense sits on the farthest right back corner. I always burn incense when talking with my ancestors and friends who have passed on. The right wall of the altar is dedicated to friends and pets who have passed on. 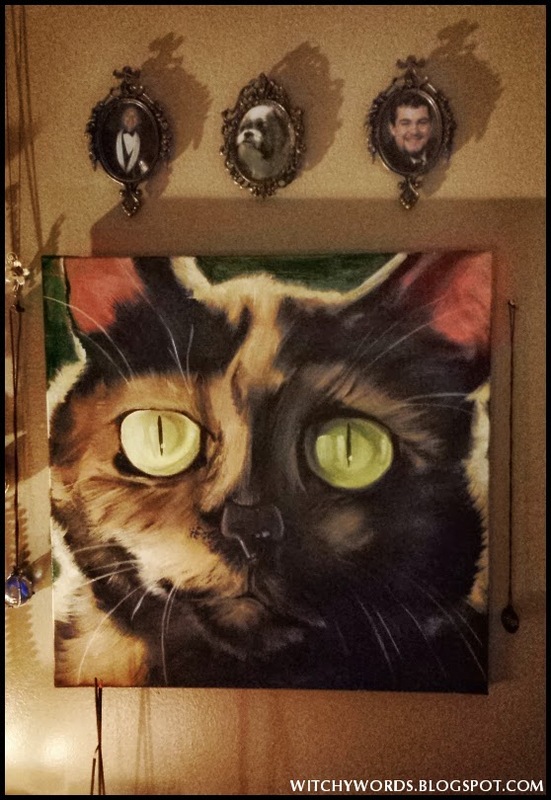 You'll see it includes a painting I did of my dearest cat Nyx who passed away shortly after Samhain 2012. Her collar tag hangs to the right. To the left of her hangs a necklace my friend Nate, pictured upper left, made specially for me. It even has a pentacle on it. Included with that necklace are necklaces from my maternal and paternal grandmothers and my maternal grandfather's pocket watch. All of these are very dear to me. There's even a space for me to hang my grandmother's rose quartz necklace when I'm not wearing it - which isn't very often. On the left side of the altar is my space for family members. This includes pictures, small skulls, rings, trinkets and even a twig of oak with acorns in memory of the deceased. The top row encompasses my mother's side of the family, including pictures of my grandparents, great grandparents and great great grandparents. It also includes a photo of my grandfather's sister who passed when she was sixteen from polio. I never got to meet her, but I'm always told I look a lot like her which gives me a special connection to her in a way. My father's side of the family. These photos are located just below the ones above. 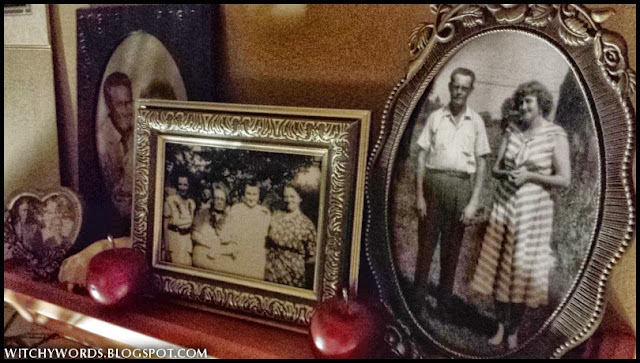 Here you'll see photos including my great grandparents. I never actually got to meet my grandparents on this side - they passed before I was born. The photo on the far left is of my uncle and aunt who raised my dad as their own when he was quite young. I referred to both of them as my grandparents growing up. So when I say my paternal grandmother, I really mean my aunt. I was fortunate enough to get to know her well, as she passed only a few years ago. I had the privilege of speaking at her funeral for the Eiken side of the family as she married in. It meant the world to me. I firmly believe that this altar helps me stay in contact with my relatives. It is the greatest dedication I could offer to them, to show my continued love and gratitude as I move through my own life cycle. What do you do to honor your ancestors? HI, oh I am soooooooo pleased to hear your alright. I must admit when I read about your possible illnes. I just felt deep within that it was going to turn out to be nothing too serious. I have had more people than I can count go to the doctor and be told they might have ms. Be put through tons of expensive and very invasive painful tests only to find out it was nothing or a very very simple thing. Anyhoo, I am so very grateful your going to be well. blessings for a beautiful day for you today. I was seeing several different doctors and each one of them got very doom-and-gloom with me. "It's probably MS, but if it's not, we might be looking at a pituitary tumor. Brace yourself for the news." After a month of not being able to see very well, I was already concerned I had something much bigger going on. Despite being a lot easier to treat, it does mean I have a heavy autoimmune issue going on. I do appreciate the thoughts though! Thank you! Hello, Oh, dear I am sorry to hear you may still have some struggles ahead. But you have such a beautiful husband, family and friends and your faith. Not to mention those fury little miracles. Drawing on the love of those around you and the wonder and magicalness of your faith. I hope can bring you some comfort and joy if and when you are feeling low. They absolutely do. Thank you so much for your comments! 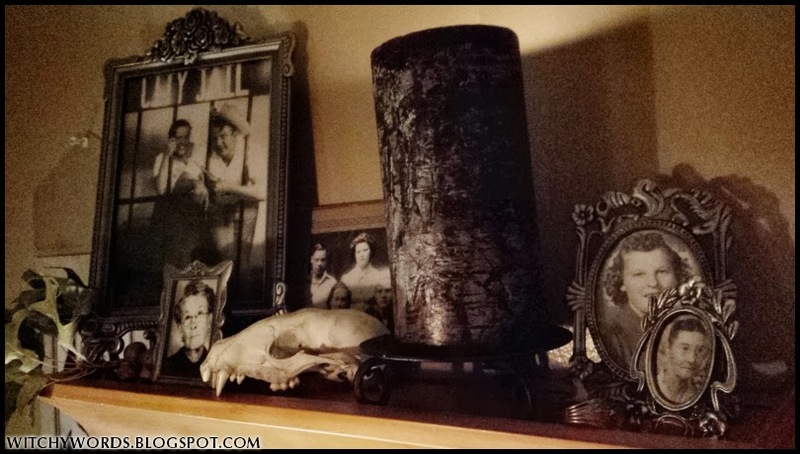 Your ancestor altar is inspiring, and I am very glad that you have gotten good news on your health! I think I'll celebrate my ancestors this Samhain with an offering of apples and a special Rune reading. :) Blessed be! Thank you so much! I hope you have a wonderful Samhain! "Paganism is all about roots, both the flora and family kind." Thank you for sharing your altar. And I'm glad you're doing better.